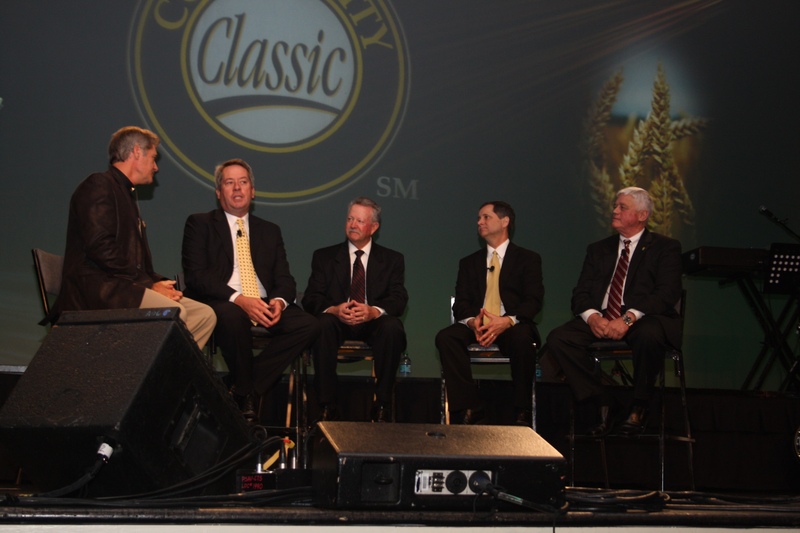 Presidents of the commodity groups at the 2012 Commodity Classic had a round table discussion during the Opening General Session. The following statement on the 2012 farm bill was released today by National Corn Growers Association President Garry Niemeyer, a corn grower from Auburn, Ill.; National Association of Wheat Growers President Wayne Hurst, a wheat producer from Burley, Idaho; American Soybean Association President Steve Wellman, soybean farmer from Syracuse, Neb. ; and National Sorghum Producers Chairman Terry Swanson, a sorghum grower from Walsh, Colo.
“Commodity Classic provides our organizations an opportunity to come together to discuss important policy issues facing our industry. As Congress continues work on the next farm bill, our organizations agree that an affordable crop insurance program is our No. 1 priority. We also stand ready to work with House and Senate Ag Committee leaders to create farm programs that provide risk-management tools to growers when they are facing a loss beyond their control. “We urge Congress to pass a new farm bill this year to provide the level of certainty in America that a short-term extension cannot.The nation is currently facing record high federal deficits and this requires difficult decisions. We stand ready to do our part to develop more efficient farm policy that will be responsive to taxpayers and effective in helping farms remain viable and productive.